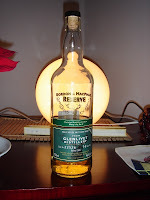 So, it's been nearly four months since I blogged about my first Islay whisky, Bunnahabhain. I'd decided it was okay, but nothing stellar, and a definite mood drink. But as I neared the end of the bottle, I found myself enjoying it more and more. I decided to chalk it up to acquiring the taste, or developing my palate, or whatever you want to call it. In the meantime, I'd been hearing a lot of good things about Black Bottle, albeit often with decidedly unpleasant-sounding descriptions (ashtrays?). Anyway, at a mere $17 USD, the price was right, so I decided to give it a go, and I'm quite glad I did. Black Bottle's main claim to fame seems to be that it includes malt from every active distillery in the Islay region, save for Kilchoman, the newest. Black Bottle is a deep copper color -- nothing special, but pleasant. Fresh fruit and malt on the nose, with earth, peat, and smoke. Light sea salt and cloves. Sweet and soft on the palate, with a smoky, lingering finish. I quite like this. The grain whisky helps the peat and smoke from being overpowering, I think, and the result is a very inviting, approachable dram. The bottle's nearly empty now, and I'm sure I'll replace it when it's gone. I'm wondering if this will prove to be something of a "gateway" whisky: my palate's expanding from Speyside/Highland single malts, to Highlandy blended Scotches like Famous Grouse, to Islay blends like Black Bottle. I recently purchased a bottle of Ardbeg 10, which comes highly recommended by those who like that sort of thing; I wonder how I'll like it! 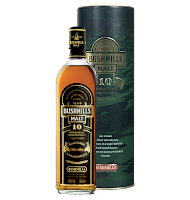 And here we are, with the first Irish whiskey on Nose Palate Finish. Now all I need is a Canadian whisky, and Japanese, and I'll be pretty well representing the global whisky scene! I was introduced to this one by my friend Aubrey. It's her favorite whiskey of all. Dr. Whisky, on the other hand, didn't care for it one bit, and I lie somewhere in the middle. A deep gold color. Bread and oranges on the nose. A bit of solvent and leather. Flowers and heavy malt. It feels very full in the mouth, and spicy. The finish is dry, hinting at chocolate. I like this malt. It's not my favorite, and it never will be (EDIT: all right, all right, maybe. Someday. Maybe. ), but I like it enough to keep buying it. I find it particularly interesting how different it tastes from any single malt Scotch whisky I've had, while still being good. Well, Sláinte! This is the second Macallan I've reviewed on this blog -- and one of my favorites so far. This one is cask strength, which means it was not diluted with water before being bottled, as most whiskies are. Thus, while most Scotches are 40-46% alc/vol, this big guy weighs in at a hefty 58.6% (116 proof)! Keep this in mind when drinking cask strength whiskies. The high alcohol content means you should drink it more sparingly than usual, so you don't get sloppy drunk (unless that's your goal, of course!). It also means you should be careful when nosing and tasting it, since it can numb your sense of smell and taste, and inhaling its vapors deeply can be uncomfortable or even painful. If you usually like to dilute your whisky before nosing it, dilute this one a bit more; if you don't usually dilute it, seriously consider doing so for this one. Oh, and I should also note that this is the USA/Canada bottling, rather than the 10yo cask strength bottling available elsewhere in the world. The Macallan Cask Strength is a lovely brown sherry color. The nose bursts with brown sugar, subsiding into strong vanilla and caramel notes. Bananas Foster and baked apples. It's very sweet. Creamy, thick, and sharp in the mouth; numbing. Cola. The finish is long, dry, and tingly. Oatmeal scotchies and cinnamon. This is one of my favorite dessert Scotches. It's sweet, rich, and deeply satisfying. My bottle's almost dry, but I'll definitely pick up another. So should you. What are you still doing here? The liquor store's still open. Get! * Michael Jackson's Complete Guide to Single Malt Scotch, p. 357. This is the first independent bottling I've reviewed on this blog. "Selected and Bottled Exclusively for Binny's by Joe C," this Glenlivet malt is part of a 306 bottle limited edition. It's a pale gold color, much lighter than perhaps any other malt I've tried. The nose is fruity, with apples and pears, followed by some soft citrus and floral notes. Its body is light and a little on the thin side, but not unpleasantly so. The whisky finishes with more florals, and lingers for a long while. Despite its rather high ABV, this is one dram that doesn't need water. I prefer to drink it straight, to preserve its delicate flavor; water would likely dilute it too much. Independent bottlings often offer a rare opportunity to sample a fine Scotch at an age that would otherwise be unavailable. Take, for instance, another Gordon & MacPhail whisky I had a while back, which was a Strathisla 17yo. I believe the Strathisla distillery itself only bottles 12yo whisky; thanks to Gordon & MacPhail, I was able to try it at five years older for less than $100. So don't be afraid -- try an independent bottling. You may like what you find!